One of my favorite things about fall and winter is apple season. I love any dessert with apples, whether it’s apple pie, apple fritters, apple crumble, baked apples… you get the idea. I simply can’t get enough of it. Yesterday, I was working on a recipe for deep-fried pumpkin pie bites. I had never made pumpkin pie before and to be honest, I have never been super crazy about it. But I had promised my brother-in-law deep-fried pumpkin pie for Thanksgiving, so I had to figure something out. 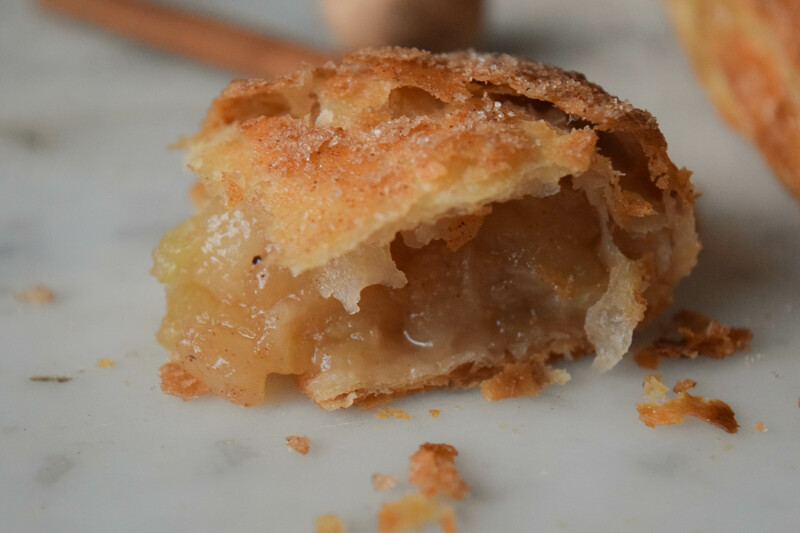 Since I had already made a big batch of pie dough for said decadent mini pie bites, I thought it would be a tragedy to not make some kind of apple pie, too. 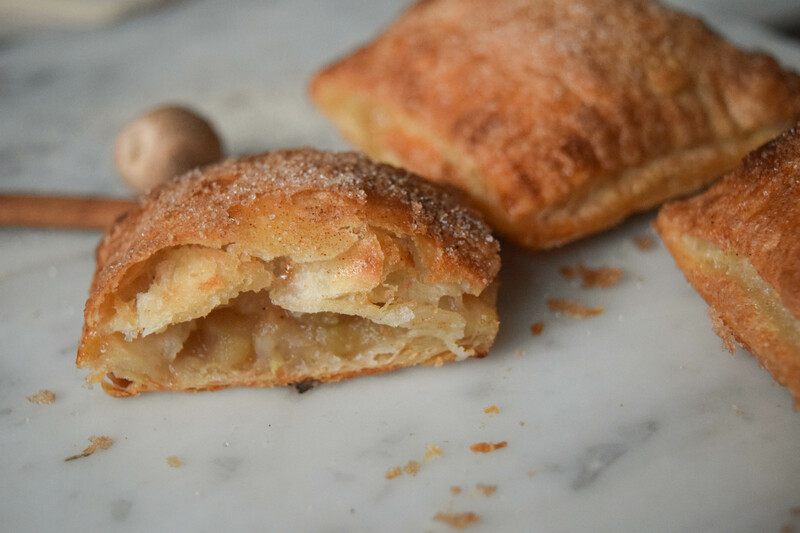 So today, I went to work to make little apple hand pies. 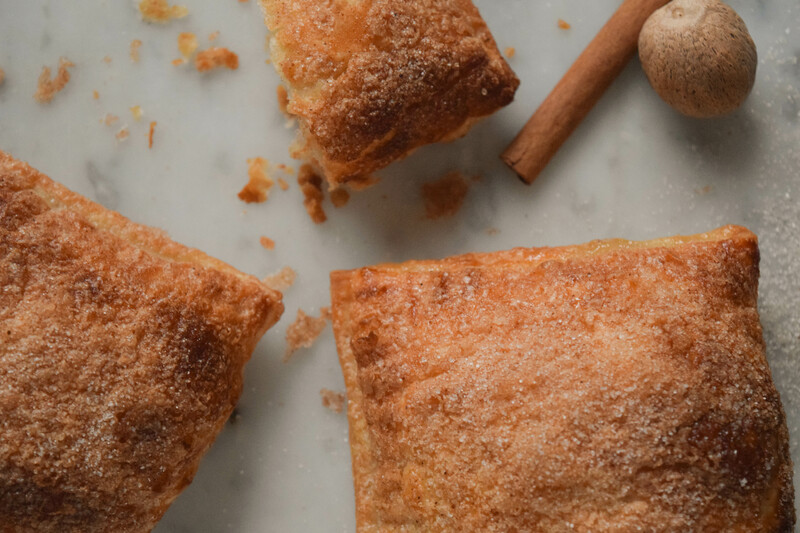 Why hand pies and not one large apple pie? They are much easier to share, you can give away smaller batches, they make better leftovers, and you can try one when the whole batch is done and no one will ever know. Win-win! I have also been perfecting my pie crust recipe of the last couple of weeks, so this version is slightly different than the one I used for the pear frangipane tart and the summer berry galette. I switched the all purpose flour for bread flour, which contains more gluten. 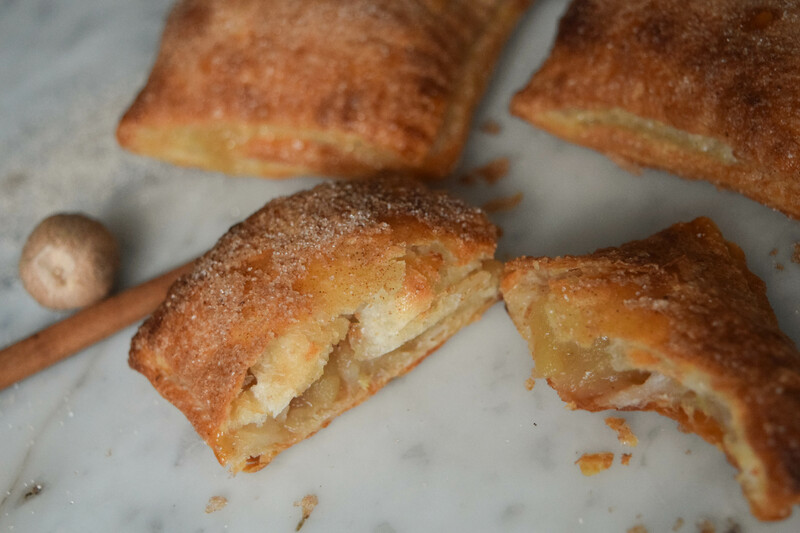 This was originally more of a last minute improvisation, because I had run out of all purpose flour, but wanted to make plum hand pies for a picnic with friends, but it turns out that bread flour makes the dough a lot more flexible and stretchy, and keeps it from cracking. 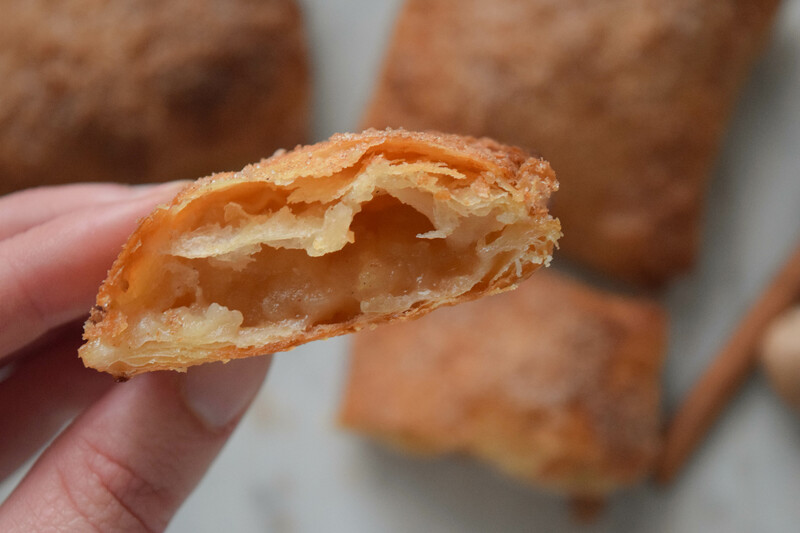 The resulting crust is super easy to work with, even closer to puff pastry than the previous version, and has a wonderfully delicate crunch to it. And it’s so easy! Place water for dough in the freezer so it will be nice and cold once you are ready to use it. Combine flour and salt in a large bowl. Cut butter into large cubes (about a cubic inch in size) and add it to the flour mixture. Pinch off large, thin butter flakes using your fingertips, until all the cubes have been turned into flakes. Go bold here, make flat flakes about the size of a quarter. Add the ice-cold water and gently fold it in, using your hands or a wooden spoon. If the mixture seems too dry, add a little bit of water. As soon as all the water has been absorbed and the dough starts to become sticky and cohesive, start folding it over onto itself several times until all the crumbs at the bottom of the bowl have been incorporated into the dough. Tightly wrap the dough in plastic wrap and let it rest in the fridge for about 30 minutes. While the dough is resting, preheat the oven to 400°F. Peel the apples and pear and cut them into small cubes. In a small or medium sized saucepan, combine the apples, pear, lemon juice, rum (or water), brown sugar, vanilla extract, and spices. Cook over medium heat, stirring occasionally, until the apples are soft and slightly caramelized and almost all of the liquid has evaporated. Set aside to cool. Now it’s time to prepare the ingredients you will need for assembling the pies. In a small bowl, scramble one egg with a fork until the yolk and white are well combined. This will be the ‘glue’ for the pies. In another small bowl, combine one egg yolk with a tablespoon of whipping cream or heavy whipping cream. This will be the egg wash for the crust. In a third bowl, combine 1/4 cup of sugar with 1 teaspoon cinnamon, 1/2 teaspoon ground ginger, 1/2 teaspoon ground nutmeg, a pinch of ground cloves, and a pinch of ground star anise. This mixture will be sprinkled over the crust before baking the pies. Line a baking pan with parchment paper. After the dough has rested, roll it out on a lightly floured countertop until about 1/8 to 1/4 inch thick (unless you have a large area to work on, it makes sense to work in batches here). Using a pizza cutter or knife, cut the dough into rectangles of about 3 x 6.5 inches. Using a pastry brush, gently coat the entire outer edge of each rectangle with the whole egg mixture. Depending on the size of the rectangles, place 1-2 heaping tablespoons of the apple mixture onto the bottom half of each rectangle, omitting the edges. Fold the top half over the filling and gently press the edges together using your fingertips. Using a fork, crimp the edges to ensure they are fully closed and flattened out a little bit. Be careful not to poke holes into the pie. Using a bench knife or dough spatula, carefully transfer the pie to the baking sheet lined with parchment paper. When all pies have been transferred to the baking sheet, gently brush the tops and edges with the egg yolk and cream mixture. Sprinkle generously with the sugar and spice mixture. Bake at 400°F until golden brown, about 20 minutes. Serve warm with ice cream or cold on their own or with whipped cream. Place the water for the dough in the freezer. Combine flour and salt in a large bowl. Cut butter into large cubes and add to flour mixture. Pinch off large butter flakes until all the cubes have been turned into flakes. Add ice-cold water and gently fold it in, using your hands or a wooden spoon. Mix until a cohesive dough form. Tightly wrap dough in plastic wrap and let it rest in the fridge for about 30 minutes. Peel apples and pear and cut into small cubes. In a small or medium sized saucepan, combine apples, pear, lemon juice, rum (or water), brown sugar, vanilla extract, and spices. Cook over medium heat, stirring occasionally, until apples are soft and almost all liquid has evaporated. Set aside to cool. In a small bowl, scramble one egg with a fork until the yolk and white are well combined. In another small bowl, combine one egg yolk with a tablespoon of whipping cream or heavy whipping cream. In a third bowl, combine 1/4 cup of sugar with 1 teaspoon cinnamon, 1/2 teaspoon ground ginger, 1/2 teaspoon ground nutmeg, a pinch of ground cloves, and a pinch of ground star anise. After the dough has rested, roll it out on a lightly floured countertop until about 1/8 to 1/4 inch thick. Brush the edges with the whole egg mixture. Place 1-2 tablespoons of apple mixture onto each rectangle. Close the pies and crimp the edges using a fork. Brush with yolk and cream mixture.